We hope this is useful! Please let us know if we've missed anything important!! The FAQ section alone should help a lot of people get a basic understanding of KM and the challenges it represents. 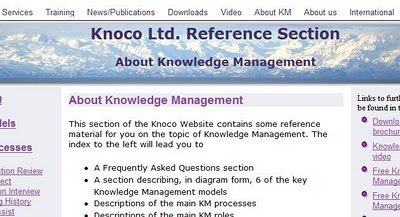 Any plans for wrapping everything into a "Knoco Knowledge Management Guide" pdf for download and printing ? Maybe update once a year - could be nice to give to clients as well ? Hmmm - hadn't thought of the "KM guide" - there may be merit in this as an ebook. I will talk it through with the guys and see what we think.